Chocolate Diets: Women's Stress Buster Diet. 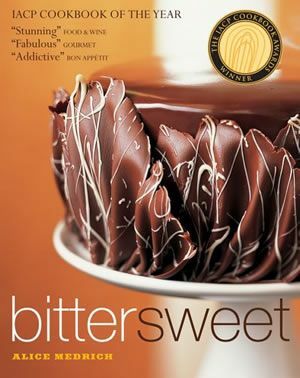 See her book to try Raspberry-Laced Chocolate Cake. Or Extra Bittersweet Ganache Truffles. Or Queen of Sheba Cake. 0.5 tbsp. Finely grated lemon zest. (1)	Line bottom and sides of a pan with parchment paper. (2)	Break chocolate into small pieces; put in a large bowl. (3)	Bring cream slowly to a light boil. Remove from heat and cool 2 minutes. (5)	Pour all of cream over chocolate; stir till all chocolate is melted and batter is homogenous. (6)	Add finely grated lemon zest and mix till batter is homogenous. (7)	Let set 1 hour at room temperature. in preparation for dipping in melted tempered Semisweet (52-62% cacao) Chocolate. The above ratio of cream-to-white-chocolate worked well for us. In contrast, another recipe pro-rates 10 oz. White Chocolate to only 1 oz. cream with 1 oz liquor; while one pro-rates 10 oz. White Chocolate to as much as 5.6 oz cream plus 2 tbsp. butter. Experiment to discover what works for you. If you make a dark-chocolate, a higher proportion of cream is likely to be better, up to 6 oz. cream with 1 oz liquor. Do not overheat (or else chocolate will seize up). If possible melt over a small pot of simmering water. Heat 11 oz. baking chips in microwave-safe bowl at medium (50%) power for 30 seconds. Stir till bowl no longer feels warm. Heat at 15-30-second intervals, stirring until smooth. Break 1 lb. Chocolate into pieces small enough to melt easily. Save 2 oz. ; heat the rest in a microwave at 800-1000 W.
Remove chocolate from the microwave every 20 seconds and stir well so the temperature is evenly distributed and the chocolate does not scorch. Repeat heating and stirring until the chocolate has almost all melted, with only a few small pieces visible. Remove from the heat and stir the chocolate well, until all the pieces disappear and a slightly thickened even liquid has been obtained. According to Callebaut, this is sufficient: 'the chocolate is tempered and ready to work with'. Heat at low power for a minute; then stir well. Heat in further 15 second bursts at low power till three-quarters melted. Stir to complete mixing and melting. Heat: sufficient to melt the chocolate but not burn it. Agitation: the appropriate beating of the molten chocolate to facilitate formation of beta-form crystals (the most stable form of cacao crystals). During beating, maintenance of temperature well within the 84-to-94-degrees-Fahrenheit range, where the beta form can become dominant. Time: allow considerable time for the gentle heating, stirring, and temperature stabilization. 20 oz. Semisweet (52-62% cacao) Chocolate. Reserve 4 oz. in substantial (1 oz.) chunks. (2)	Dip the truffles in the tempered chocolate. while tempered chocolate is still soft. Fabulous recipes arriving every couple of months. Forests and Trees; disclaimer; links; book advice.